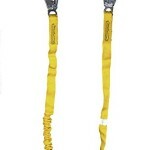 Titan pack-type shock-absorbing lanyards is lightweight and has durable webbing for all day comfort and dependability. The outer jacket serves as a back-up web lanyard. 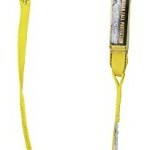 Pack-type shock-absorbing lanyards include the shock absorber pack as an integral part of a standard lanyard. In the event of a fall, the pack expands to reduce fall arrest forces while a back-up safety strap deploys for added fall protection. It has locking snap and rebar hooks. 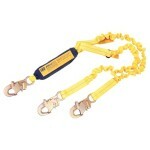 Available single-legged models and two locking snap hooks. Measures 6-Feet length by 4-Inch width 3-Inch height. Meets all applicable OSHA, ANSI and CSA standards.